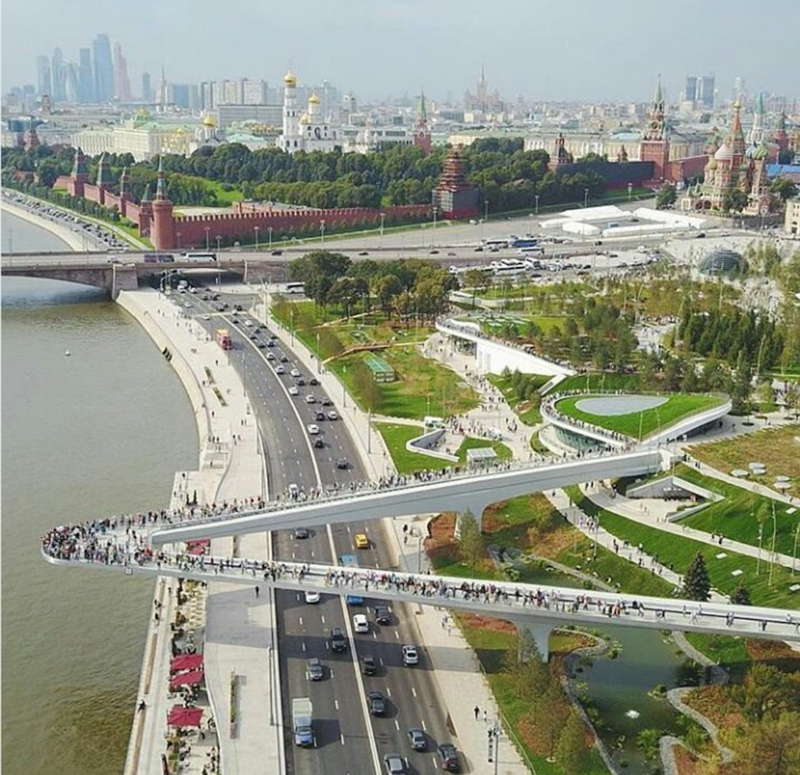 Moscow’s first new park since 1958, Zaryadye rubs shoulders with the Kremlin and marks a major new step in the capital’s urban development. But will it actually serve the city’s residents, or is it just another elite vanity project? The Calvert Journal reports from the site’s grand opening last week. 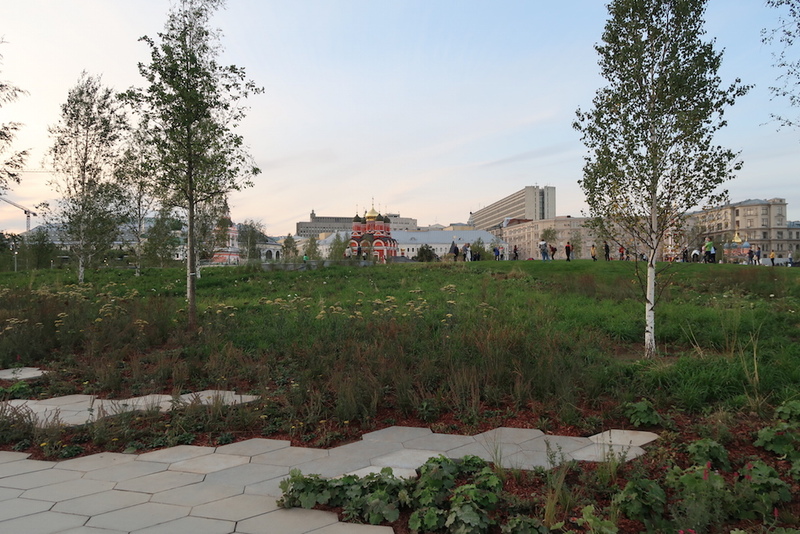 The opening of Zaryadye Park is a momentous, long-awaited event for the Russian capital. 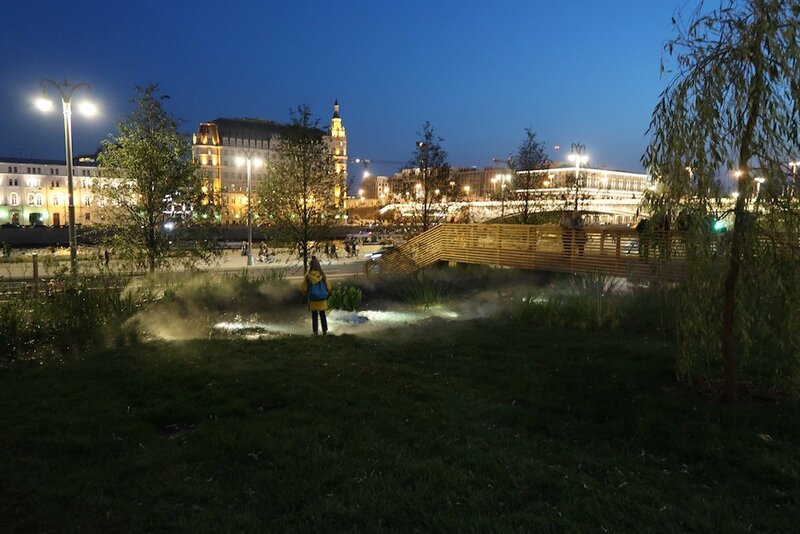 Completed in less than three years following an international competition launched in 2013, Zaryadye is the first large public park created in Moscow since 1958. 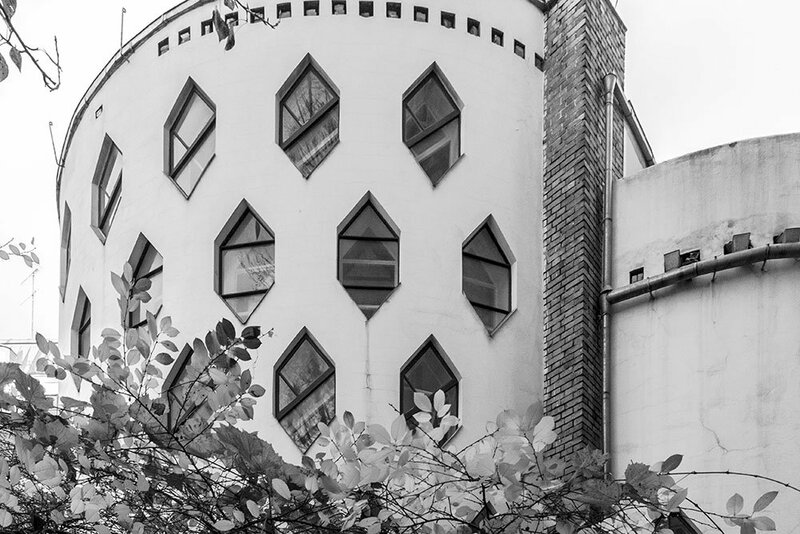 A succession of grandiose architectural competitions have been held for Zaryadye since the mid-1930s, with the involvement of some of Russian’s finest avant-garde and classically minded architects — Konstantin Melnikov, the Vesnin brothers, Alexey Shchusev and many others. In 1947, Soviet architect Dmitry Chechulin was chosen to prepare a design for a 275-metre administrative tower on the Zaryadye site, but construction was abandoned in the wake of Stalin’s death. 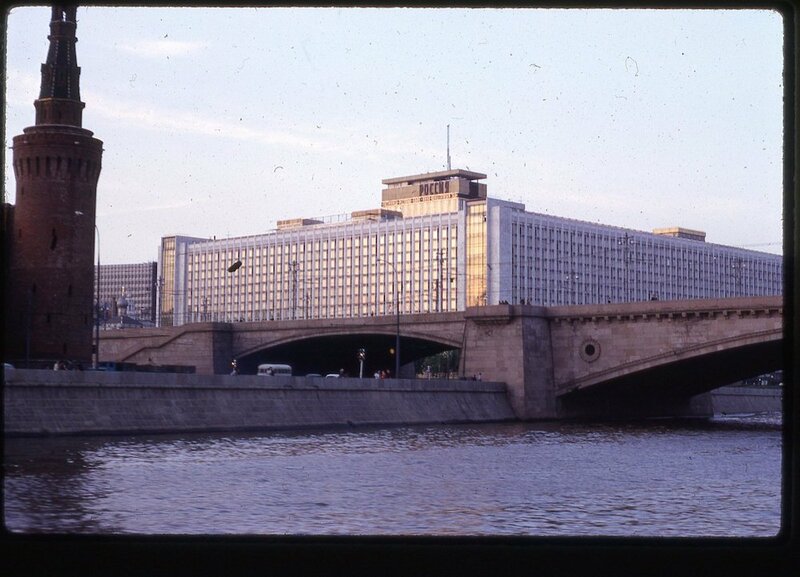 A decade later, however, the stubborn Chechulin succeeded in transforming his Stalinist skyscraper into the modernist Hotel Rossiya — built on the same foundations. Rossiya was itself dismantled during 2006-2008 on the initiative of Mayor Luzhkov, to make way for a Norman Foster-designed commercial development. The project was mired in corruption allegations, however, and abandoned following Luzhkov’s dismissal in 2010. 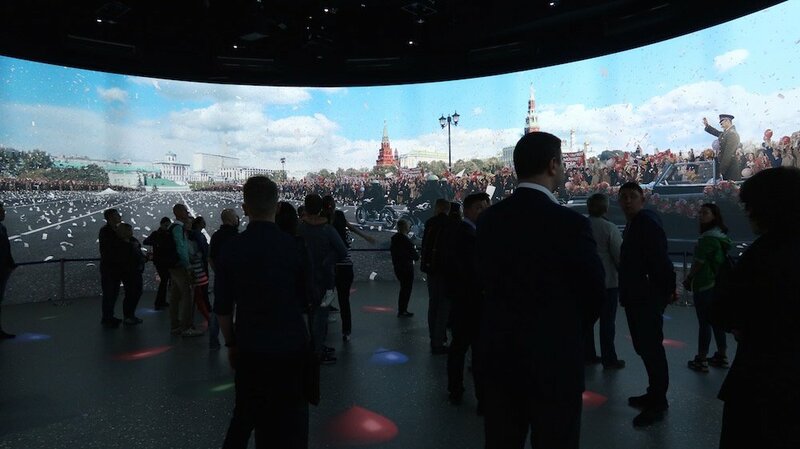 The ruins of the Rossiya stood empty, cloaked in the world’s largest advertising hoarding, until — so the PR legend has it — Putin visited the Zaryadye wasteland together with Mayor Sergey Sobyanin in February 2012, and decreed that “the golden land next to the Kremlin would be given back to the city and its inhabitants”. The competition, held in 2013, was won by hip Manhattan-based architects Diller, Scofidio + Renfro, authors of Manhattan’s famed High Line. At 1pm, when Vladimir Putin is led through the park by Sobyanin, the sky is still thick with clouds. Putin doesn’t say much, but smiles unceasingly throughout the tour. As he approaches the stage of the main amphitheatre, a band led by veteran jazzman and Putin buddy Igor Butman launches, surreally enough, into Soul Bossa Nova — the theme tune from Austin Powers. As the president walks by, Butman bounds from the stage to hug his chum. 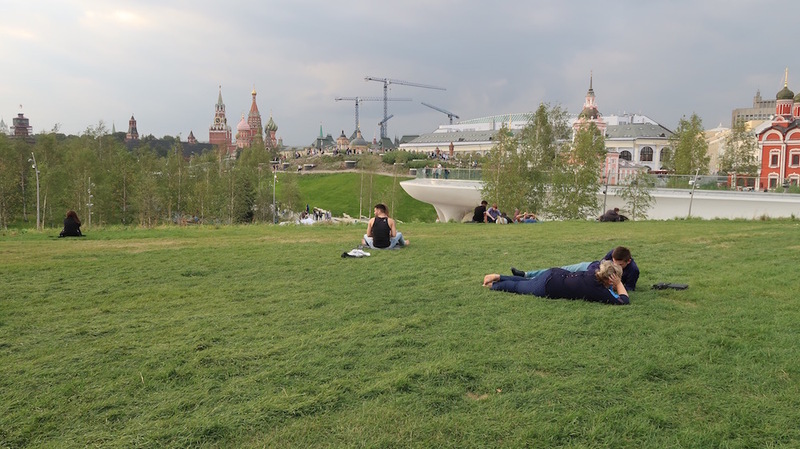 By 3pm, when Zaryadye Park opens its doors to Muscovites for the first time, the city is drenched in sunshine. For its first weekend, entry to the park is “gifted to the children”, as the banners outside declare. Not to all children, mind you, but to various special categories of bright and needy children. Also in attendance are journalists, VIPs, municipal bureaucrats, park employees and motley plus-ones. “Come back on Monday,” the green-jacketed volunteers tell everybody else, to mutterings of discontent. 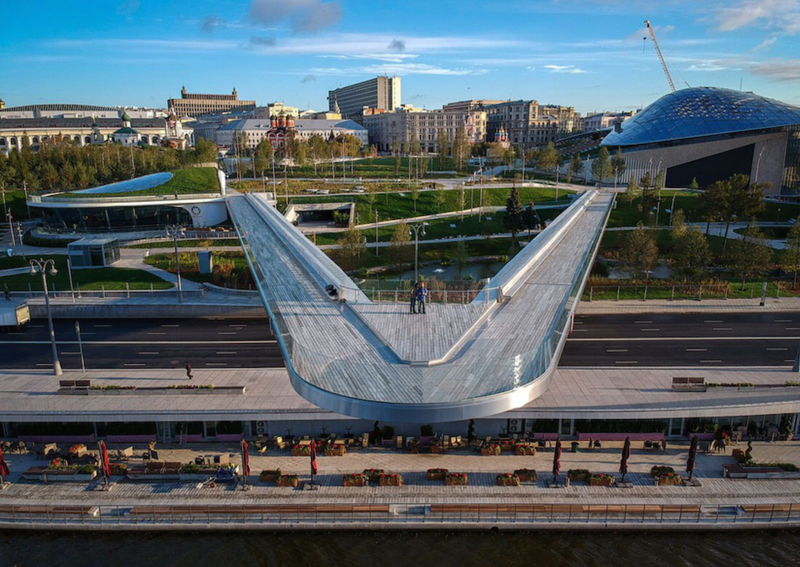 Eventually, the throng finds its way onto the park’s boomerang-shaped pier, officially named the “Soaring Bridge” (Paryashchiy Most); “More like “Lousy Bridge”,” (Parshyviy Most) we overhear someone pun, an allusion to the fact that the bridge does not, in fact, lead to the other side of the river. They take selfies. We all take selfies. And we all have good reason to do so: the architecture is outlandish, the landscaping is outstanding and the views are breathtaking. 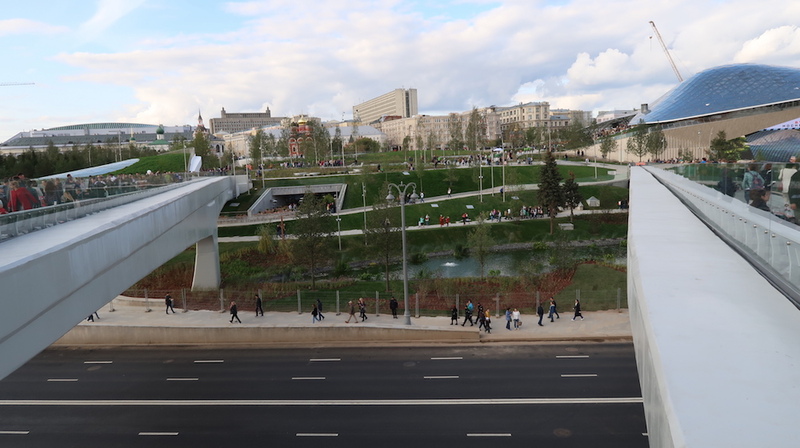 In the architects’ concept, Zaryadye comprises a potentially endless series of “unscripted” pathways; park users are encouraged to “lose themselves” in the landscape. And, indeed, lose and take leave of themselves they do. As they make their way through the birch, coniferous and coastal forest, the steppe, the meadows and tundra — these represent the various Russian landscapes “gathered” on the site — users begin to behave in unexpected ways. 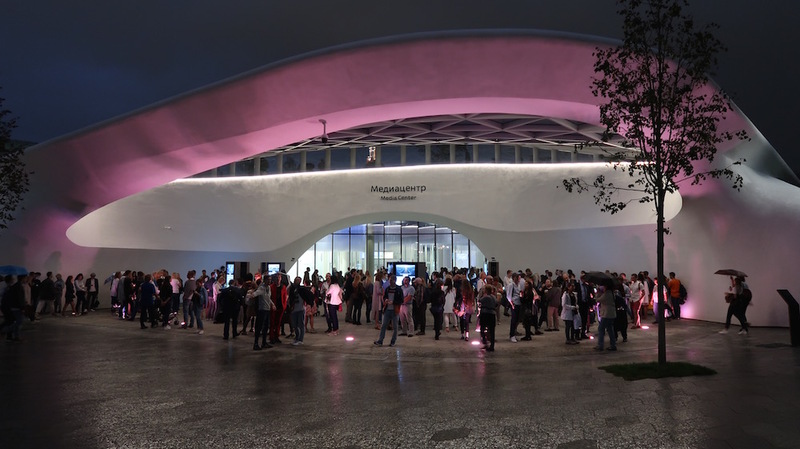 On the Tuesday evening following the opening, the park’s management issues a press release cataloguing some of the perceived outrages visitors are accused of having indulged in: exotic wild plants have been uprooted; turf ripped from the ground; a 300-kilogram glass slab from the roof of the media centre has been smashed (none of the 300 cameras installed in the park managed to record the event, apparently; “just like Nemtsov’s assassination,” someone mutters to themselves). 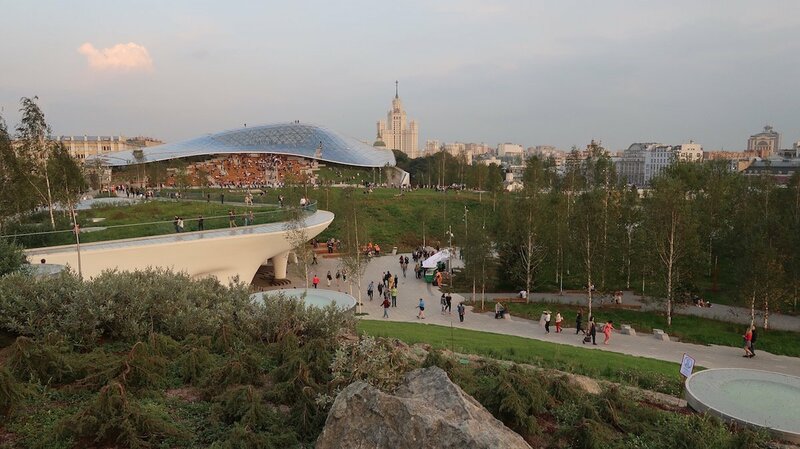 The landscape is dotted with curvaceous structures, housing a slightly random jumble of functions: a so-far-unfinished Philharmonic Hall, to be directed by Putin’s favourite maestro, Valery Gergiev; a very bouji food-court and restaurant; a Media Centre featuring a patriotic and pricy animated historical panorama of Moscow and a simulated fly-through over the capital; a “Nature Centre” containing a science and ecology education facility. The neutral bionic structures of the buildings, however, interweave with the landscape levels, so they are not — in most cases — overly obstructive. The vast volume of the Philharmonic Hall is hidden inside an artificial hill and topped with a giant glass hat. 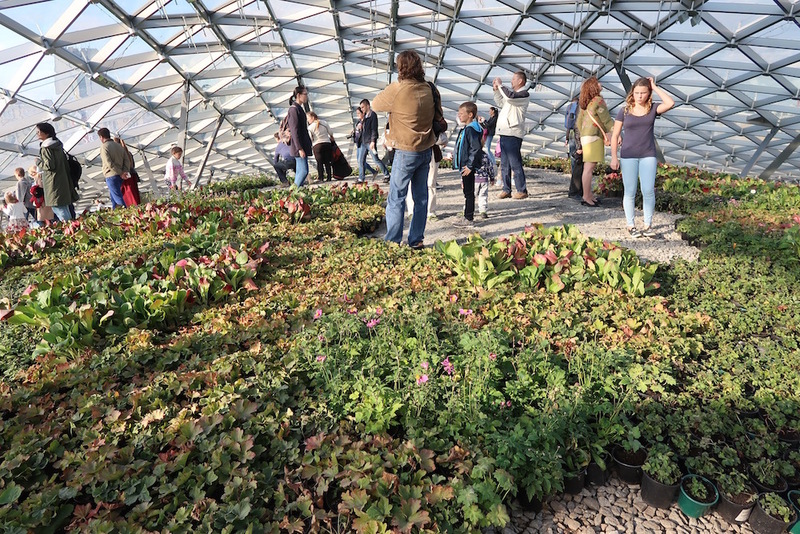 Most of the park’s structures are covered with accessible green roofs, so that all possible areas are used, “creating a series of elemental face-offs between the natural and the artificial”. A blatant exception to this rule will soon be provided, however, by the nowhere-near-finished Zaryadye Hotel, a scandal-ridden private investment in the north-eastern section of the park site, which has already resulted in the demolition of a valuable Art Nouveau tenement house, and which appears to have claimed the life of its first investor — billionaire businessman Dmitry Shumkov — found hanging from a necktie in his luxury Moscow apartment, in what investigators enigmatically described as a “non-criminal” suicide. The upper summit of the “tundra”, atop the Media Centre, is the park’s wildest point. Those able-bodied enough to have made it up the steep path stumble around amid wantonly strewn boulders. The music pumped exhaustingly into the park through its comprehensive tannoy system can only faintly be discerned from here. Also conspicuous are several uniformed guards: perched proudly atop their chosen boulders, they survey their terrain, sometimes gracefully intervening to protect a rare grass from being trampled. 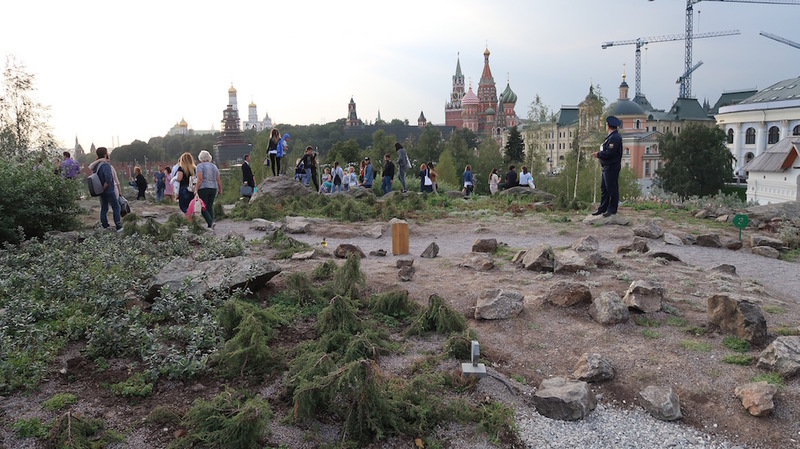 The vaguely post-apocalyptic sense is deepened by the close proximity of Moscow’s ancient side: the patchwork domes of St Basil’s Cathedral, the Kremlin Towers and the surviving spires of old Zaryadye are now seen through randomly placed birch trees. 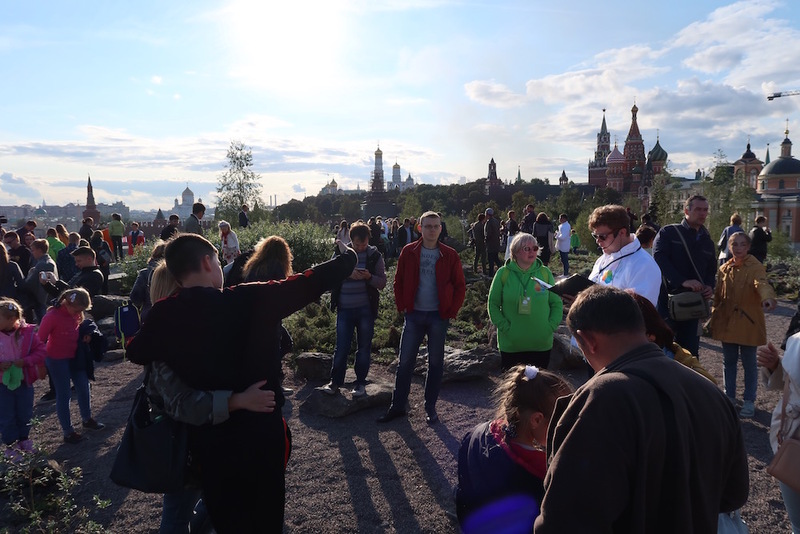 Here, tourists and Muscovites alike glance at their city from a truly unfamiliar perspective. The sense of discovering the city anew — one of the key design principles of “wild urbanism” — is undeniably felt, and its effect is arresting. Here, it is hard not to appreciate the success with which Zaryadye’s wilderness has been programmed, its unscriptedness scripted. During the park’s presentation, Charles Renfro declares that the project was animated by the desire to “transfer the site, heretofore in the private sector, into the public realm. A city’s citizens should be valued over private interests or political gain.” This noble vision glosses over the many compromises and calamities inevitably implicated in a project of Zaryadye’s scale. All the more so in the turbo-capitalist context of late-Putinist Moscow, which is more habituated to high-rise profiteering than mossy urban wildernesses. A common reaction (which we shared) was disbelief that the project even came to pass on time. “You should have seen this place just yesterday!” Renfro exclaimed. “Mud everywhere, chaos. 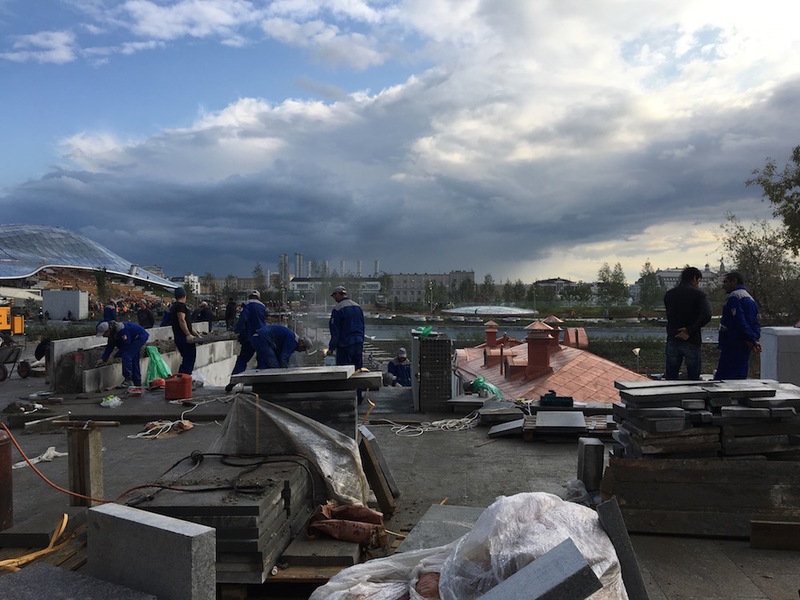 It’s shocking what can be done when you put thousands of workers at something!” Indeed, just two days earlier, the scene at Zaryadye was unrecognisable. The clouds were thick and the rain unceasing. An ocean of workers, among them many migrant labourers from Tajikistan and Kyrgyzstan, were engaged in seemingly thankless labour in the muddy foundation pit. Piles of dirty, chipped paving stones lay forlornly in the deluge. 48 hours later, Zaryadye was drenched in sun and the park — at least on the surface — looked ready. The gastarbeiters, of course, were all gone. They had not been invited to the opening ceremony. 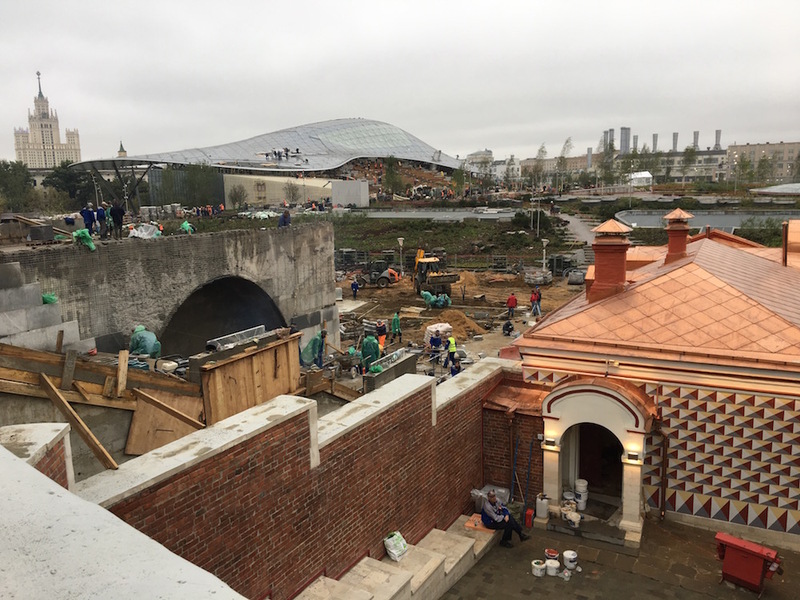 Several days later, however, a large group of about 20 Central Asian workers were discovered inhabiting the murky subterranean maze beneath Zaryadye. Thousands of miles from home and with nowhere else to go, they had made a temporary home for themselves in the sewage-deluged foundations of the unbuilt Stalinist tower and the Hotel Rossiya. 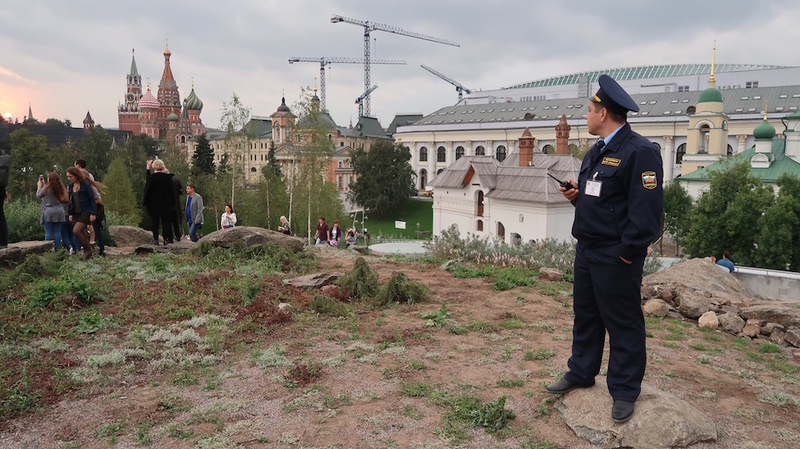 The migrant labourers, however, are not the only ones who may have reason to feel alienated from the photogenic surface of Moscow’s new, Instagram-ready park. Zaryadye’s complex, multi-level structure is very difficult to navigate for disabled people, and precious few ramps and lifts are provided to gain access to some of the park’s most atmospheric nooks and crannies. 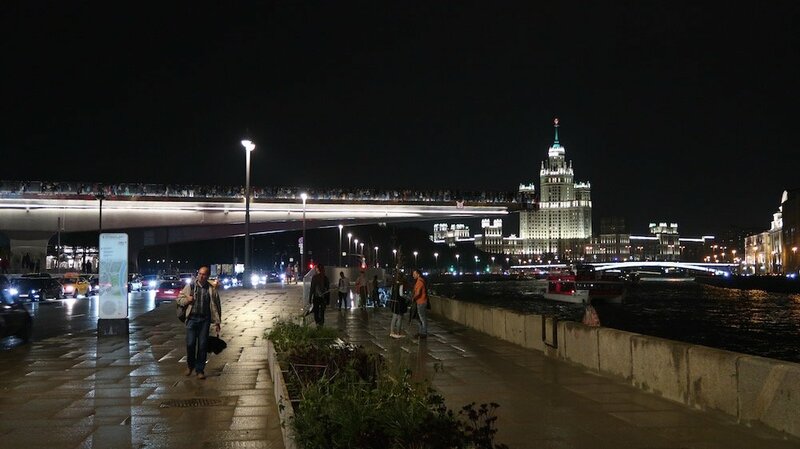 There is little indication, furthermore, that the gleaming public spaces of the centre will ever be replicated in Moscow’s outskirts, where 80 per cent of the population actually lives. Evenness is extrinsic for Russia — Moscow’s centre is to its suburbs what the capital as a whole is to the rest of the country. While the old Soviet mikrorayony provided leisure infrastructure within walking distance of one’s home, now the old cinemas, clubs, parks and stadiums are either dilapidated or demolished. 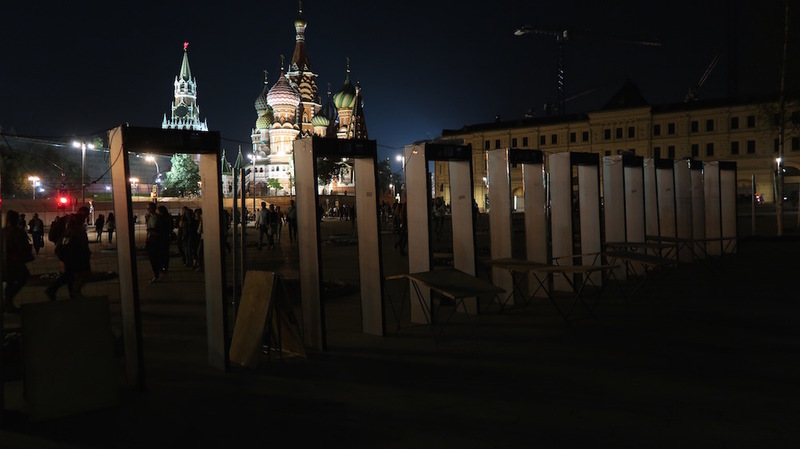 The environment in which the majority of Muscovites spend their lives is simply not on the municipal authorities’ radars, and they are transformed into tourists in their own city. For that “provincial” Muscovite, Zaryadye may take an hour and a half to reach by public transport. There is no doubt that the very realisation of the park was only possible not just through the toil of the thousands of workers who built it in record time, but also thanks to the bloody-minded determination of a number of Moscow personages and institutions: Strelka Institute; the city’s Chief Architect Sergey Kuznetsov; the team of urban design consultancy Citymakers. 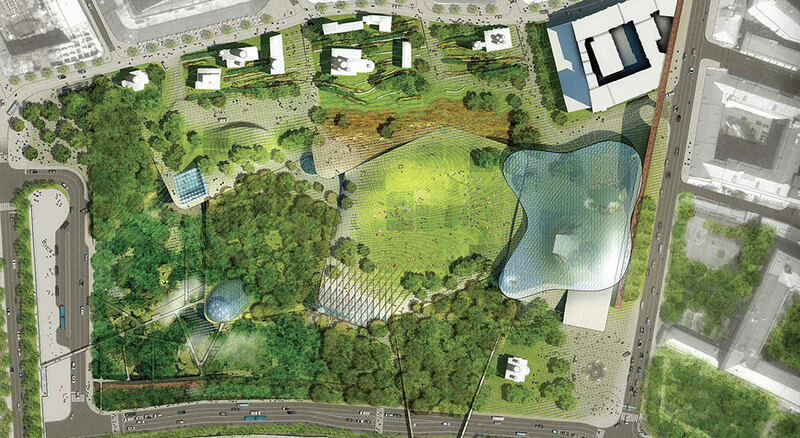 City officials present at the opening, such as the head of the municipality’s Culture Bureau, openly expressed their disbelief that the park project had ever gotten so far. It will take even greater stubbornness, determination and imagination, however, to ensure that Zaryadye grows into a genuinely public, accessible terrain, and does not degenerate into a fenced-off, hyper-securitised eco-enclosure for Moscow’s able-bodied bourgeoisie. 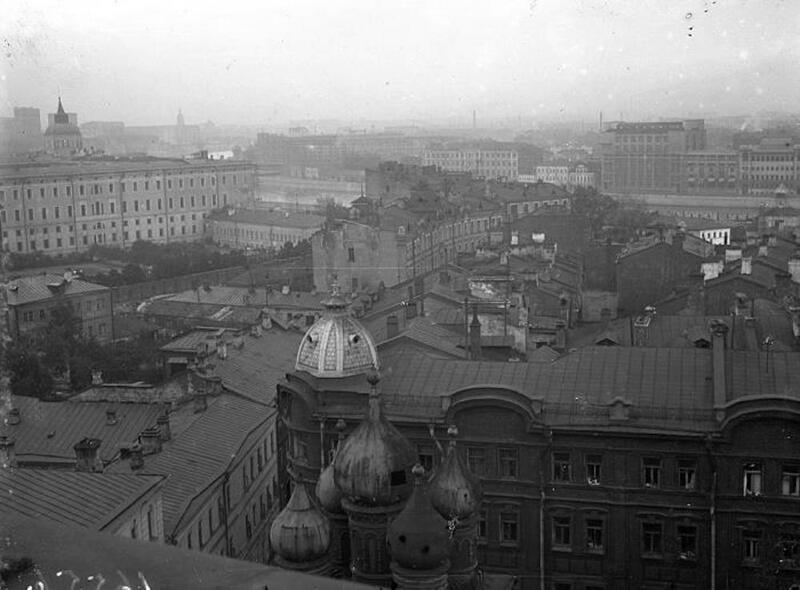 City of disappearances: how do you conserve buildings in a Moscow turning its back on the past? 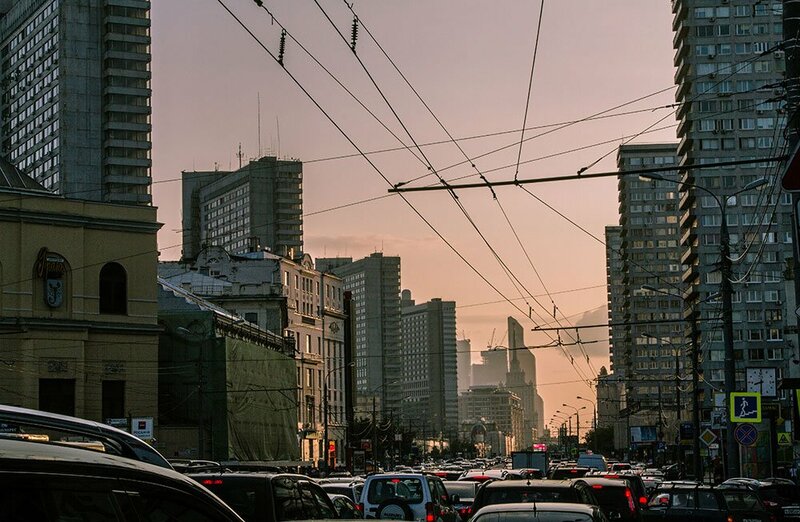 How to fix Moscow: can a new wave of urbanism transform the Russian capital?